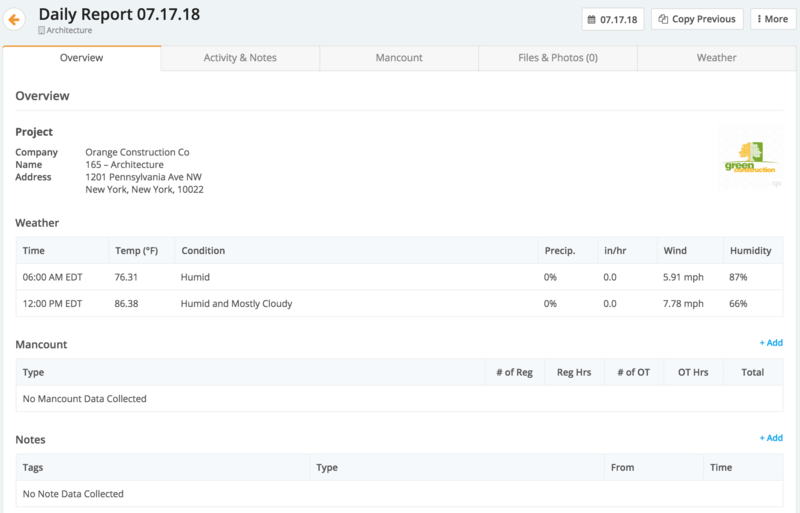 Daily Reports makes it easy to record the attributes and activities happening across all of your project. Click the Projects tab in the left navigation bar. Then select the relevant project. Once you select the project ( or create it ), you'll be taken to the Project Summary page. There you can preview the latest Daily report and either head there directly or view the past week's daily reports by selecting the Daily Reports tab. If you click the Daily Report tab, you'll see a preview of various reports which will display how many notes are attached and the hours attributed to each report. You can also view a range of Daily Reports from the past by selecting the calendar and setting a date range. Once you select a date, or if you clicked the Go to latest button on the project summary page, you'll be taken to the Overview page. Here you'll see the project information with the address, mancount, recent notes, and recently uploaded photos. These fields are populated as they are added into the Daily Report. You'll also be able to see the weather if the project has a valid zip code in the Project Address. Clicking the calendar will allow you to select the date range for your reports. This enables you to view all past reports. Copy Previous allows you to copy the same entry from a previous day and append it to the current one. Export the Daily Report to download a pdf with all the report details (including any photos) linked to the day. Email Daily Report sends a reports to any recipients selected. 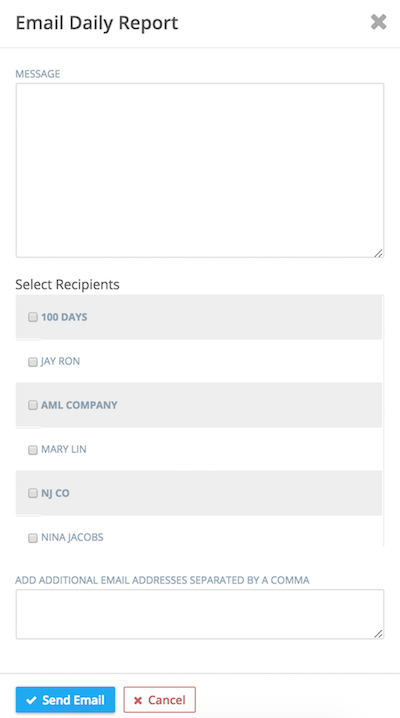 You can also add other email addresses that may not be seen in the Select Recipients field. To prevent any changes from being made to a Daily Report, click the Lock Daily Report button. The locked report can be unlocked by the project controller, by clicking the Unlock Daily Report button. Now that you know the basics, click here to learn more about Daily Reports.